Replace “wine” with “vegan chocolate,” and that’d be fine, thanks. Happy almost summer, mamas! -Start small. Maybe you can’t get through a whole book at first…choose a shorter one. A board book, maybe, that’s more tactile, with things to push or pull or touch. Then work your way up to longer ones. -Choose appropriate books. Babybug and Hello magazines have some great little poems and rhymes, and you can get an iPad subscription now. Don’t try to start them off with something heady or intellectual…there’s some rather academic picture books out there. Choose something sing-song, something memorable with interesting, colorful illustrations. Ebooks are okay, but most kids prefer to read on paper. -Do the voices. Sure, I get that not everyone is comfortable with a dramatic reading, but come on, it’s a pretty friendly audience. Throw some silly voices in there and make it come alive! -Put them on your lap. Kids love sitting with you more than anything, and it makes it easier to contain them, easier to see the pictures. -Engage with the book. If it’s obvious you’re trying to get it over with as quickly as possible (what? No, I never do that at bedtime every night…), it’s pretty obvious to them. So go ahead and ask some questions. If the character is about to make a big decision, ask your child what they would do before you read what comes next. Have them make a prediction based on the title. Point out a little detail in the illustrations that the text doesn’t mention. Connect it to another book or life experience you’ve shared. Most of all, don’t ignore their questions! If you don’t know the answer, re-read to find out or look it up online. -Choose books you liked as a kid. My own kiddos love to hear that this was a book Grandma read to me; it becomes more than learning. It’s tradition. -Read nonfiction. Kids are curious about the world and love to know how to things work. When you hit the “why?” stage in preschool, nonfiction books are a nice outlet for that. And there is some AMAZING nonfiction out there now. -Model for them. Kids want to be like you, right? (Trust me, they do.) So I let my kids see me reading books that are interesting to me, magazines, graphic novels, my Bible, a letter, anything. It makes reading part of your family culture, not just a school-type demand. Plus, it’s an excuse to put your feet up and ignore them for a few minutes in the name of good parenting! Win win. You can totally raise a book lover. And it is so much easier if you start when they’re little! -On Soundcloud. They have a nice app for your phone and if you add to a playlist or a station, you’ll always see when a new one’s posted (I think). And please, if you like it, hit like and share it! Let’s spread the word. And if you’ve got more questions for me, don’t miss out on our first Twitter chat! Here’s the post on that, in case you missed it. One of the ways I keep my kids happy in church is books. But I found that if I brought books with words in them, they always wanted me to read them. So the solution was…wordless books! And if you can, get actual paper books; it hasn’t worked well to take the tablet with us, as they inevitably want to play games instead of read. One book that has a more spiritual aspect is Noah’s Ark by Peter Spier. This one has some humor that older kids will pick up on, like how there’s two rabbits when they get on and about 100 when they get off. 🙂 His illustrations are very thought-provoking with some beautiful details. 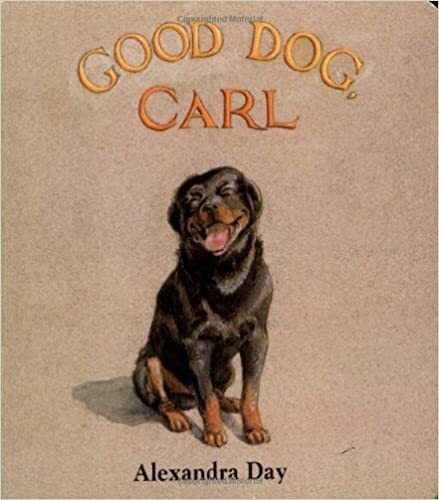 When my littles were little-little, they also loved Good Dog, Carl. The mom goes out (!!) leaving the dog in charge (?! ), and he has to keep the little girl from getting into trouble (…?!!?!?). Ok, so the premise is a little “old-school,” but it’s pretty cute. But also, don’t do any play dates at Alexandra Day’s house, mmkay? I haven’t read this one, but it’s going on my Christmas list…to quote from someone who’s read it, “Two stories and two cultures are told simultaneously in one book. The stories appear side by side as the reader turns the pages at the same time. Mirror follows a typical day of two boys on opposite sides of the world. The stories take place in Sydney, Australia, and Morocco, North Africa.” Amazing, right? And last but DEFINITELY not least, if you need a wordless book for an older kid who’s struggling with reading, I highly recommend The Arrival by Shaun Tan. Mamas, I got this book from the library on furlough, and I stayed up until midnight reading it. I’m usually asleep by 10:00…and y’all know how precious sleep is. It’s that good. And third culture kids will really connect with the story of a man entering a culture that seems completely foreign to him for the sake of his family. It’s so true to the emotions of moving to a new place, but I think anyone could enjoy it. And apparently, I have good taste, because all the books I recommended are also on this list of Reading Rockets’ Favorite Wordless Picture Books. Maybe now we can get through worship without having to step out, eh? You’ve got this, mamas. One thing I’ve noticed is that people think teaching is easy. And maybe it is for some people…but for many of us, things like classroom management and bonding with students must be taught. Loved this gal’s perspective on teaching abroad, especially her teachable spirit to glean from local teachers. That’s success right there. Note: I’m not seeing a way to download it from the app…weird. Sorry. Okay, so E is always sticking stuff up her nose, so I know it’s just a matter of time before I use this trick. Also, we’re overseas, so it’s harder to get to medical care…and frankly, I just thought this was genius. So enjoy Georgia and her ill-fated nose incident! Mamas, meet my friend Tina. We were in Bible study together here in Haiti, and her words have spoken comfort to my soul for many years now. And now, she’s graciously agreed to share some wisdom with you, too! Enjoy. I thought about how hard it was just to get their clothes clean, how they had no idea about movies and concerts their stateside peers were watching, and the fact that instead of neat uniforms and baseball leagues, they played soccer with a duct-taped flat ball in the street. Their Wodaabe peers were finding wives at 14 and their missionary kid friends were just as clueless about the states as they were. My children were in a “youth group” made up of maybe 10 people ranging from 6-18 and I remember their Sunday nights together involving games of Sardines. Would they ever be able to make it back in the States? Would they be impossibly out of touch? Had I failed them? My friend said something suitably comforting, and I moved on, but still struggled with doubts about our move to the Sahara with three sweet kids, and then later, to Haiti with my youngest, a girl of fourteen at the time. Sometimes they felt superior or inferior or just weird. Helping them through that wasn’t always fun. Again, doubts. Did we let them down? Fast forward to three married kids, one with his own children. The long view back over the years is a luxury I don’t take lightly. My overwhelming sense now is simply that God helped them. He brought people along who taught them how to make the culture leap, interpreters and patient friends who could bridge the gap. He gave them a groundedness and faith that was vibrant enough to withstand the isolation. They became very insightful about American culture and good at navigating it while holding on to their early experiences. And they became good friends to each other and to us. And they DID end up able to enjoy July 4th celebrations, league baseball and dances. Consider your hand patted, mamas. Mine included.